Home Internationals Folau’s Follies, Part 3. A week back, Israel Folau set a new try scoring record for Super Rugby. His try against the Blues saw him hit the 60-mark, one ahead of All Black Doug Howlett, for a record that is likely to stand for many years. Long after Folau retires from the playing fields, that record will reflect his unique skills and ability to finish movements with tries. His aerial skills are almost supernatural, and his big yet lithe muscular frame and pace over the ground combined in an athlete of superior quality. That 60-try mark would probably be higher, it was a number that he was likely to add to during the rest of his career, especially after he signed an extended four year contract with Rugby Australia and the Waratahs in October last year. That contract, still has more than three years left to run, and is worth a reported A$4m (£2.19m or R40m) a year. Add the product endorsements and appearance fees, the public speaking fees, and all the personal sponsorships, and Israel Folau was the highest paid rugby player in the world. Not only was Israel Folau on a roll financially, but as a player he seemed to be getting back to his peak form, just in team for the 2019 Rugby World Cup in Japan. But then it all started to go wrong. Just as it seemed as if Israel Folau had everything to play for, it seems that his rugby union career may be over. Rugby Australia and the Waratahs have confirmed that Israel Folau is to be sacked after refusing to respond to attempts to contact him following yet another homophobic and hateful social media outburst. In a joint statement issued by Rugby Australia and theWaratahs, it was confirmed that the failure of the 73-cap international to respond to the governing body – as well as his representatives – has left them with the “intention to terminate his contract”. RA’s integrity unit attempted to make contact with Folau on Thursday but could not reach the player, and a decision has been taken “in the absence of compelling mitigating factors”to issue notice to him of their intention to tear up his contract. The statement issued by RA chief executive Raelene Castle and NSW Rugby Union CEO Andrew Hore read: “Rugby Australia and the New South Wales Rugby Union have made repeated attempts to contact Israel both directly and via his representatives since 6.30pm on Wednesday, and at this point he had failed to communicate directly with either organisation. “Whilst Israel is entitled to his religious beliefs, the way in which he has expressed these beliefs is inconsistent with the values of the sport. We want to make is clear that he does not speak for the game with his recent social media posts. “As a code we have made it clear to Israel formally and repeatedly that and social media posts or commentary that is in any way disrespectful to people because of their sexuality will result in disciplinary action. He could yet respond to the governing body with an explanation for his recent actions that can be taken into consideration, but unless he resurfaces soon RA are ready to sack him just five months out from the Rugby World Cup. The Wallabies other major corporate sponsor, Asics, is reportedly also reviewing their involvement with rugby after Folau’s latest follies. It quickly emerged that other Wallabies players had “liked” Folau’s latest controversial social media post. As of midday on Thursday, Samu Kerevi and Alan Alaalatoa had liked the photo, while Henry Speight is understood to have “unliked” the post, as had several other rugby players. There may be a backlash against players who have liked the post, especially in the eyes of the personal sponsors of individual players and the Wallaby team sponsors. Last year Curtis Rona wrote on social media: “We Stand With Israel Folau” only to become the target of a social media storm all of his own making. 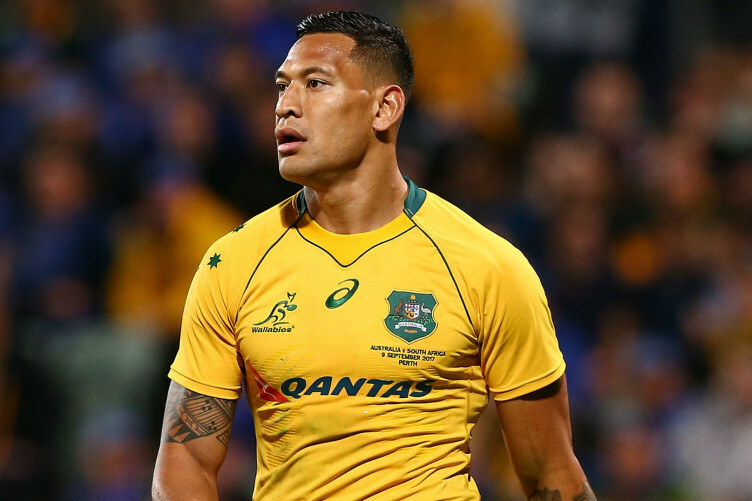 Israel Folau is arguably Australia’s most influential player in Michael Cheika’s squad, scoring 37 tries in his 73 Test appearances that puts him level-third on the all-time try scorers list alongside teammate Adam Ashley-Cooper. Only Australian rugby legends David Campese (64) and Chris Latham (40) have more Test tries to their name. He would, undoubtedly, have been one of the first names on the squad list for both the World Cup and the Rugby Championship, which begins in July, but it appears that his comments have cost him both his place in Cheika’s plans and also his career with both Australia and the Waratahs. Folau has also faced a fierce backlash from fellow professionals after posting a message on Instagram on Wednesday that claimed “Hell awaits you”for “Drunks, Homosexuals, Adulterers, Liars, Fornicators, Thieves, and Atheists” in a religion-based tirade. England’s retired hard-man prop forward Joe Marler responded to Folau’s tweets by posting a picture of two men kissing. Aussie Matildas captain Sam Kerr joined the fray in condemning Folau. She wrote: “Australia, we should not let athletes or ANYONE preach this hate in our country … you must be proud @wallabies @nswwaratahs”. Former All Black Adam Thomson called on current Super Rugby players to take a stand against the anti-gay social media posts – and refuse to play against the Waratahs if they fielded him in their team. “And I think I’m calling you out for the right reasons. Whether I’m right, whether I’m wrong … I’m not sure, but the post you’ve made is wrong. And I think you should make a comment and apologise or do something to make amends. Former Wallaby Jeremy Paul says that he understands that Folau has certain beliefs, but can’t comprehend why he feels the need to express them in this matter on social media. “You can’t bring the game into disrepute,”Paul said on Fox Sports program Bill & Boz. “You can’t … go out and do stupid things on social media. I just want to ask the question, what do you want to get out of it? We all know Israel, what his beliefs are and we all understand he’s very religious but I just don’t understand (why he needs to post this content)”. Ex-Wallabies forward turned journalist Peter FitzSimons — who has criticised Folau for his views in the past — slammed him again and said Rugby Australia needs to cut him loose. “In the wake of his latest homophobic outburst — gays, among other sinners, are heading to hell once more — Israel Folau has to go, and will go,”FitzSimons wrote for the Sydney Morning Herald. It is important to note that Folau’s comments and beliefs are not legal grounds for dismissal by Rugby Australia and the Waratahs, no matter how despicable and unacceptable many may consider them. The legal grounds for dismissal are apparently that Israel Folau is in clear breach of his contract with his employers. His new contract with Rugby Australia, signed in October 2018, reportedly has a clause restricting Folau from making any provocative social media posts, and that there were additional social media protocols that Israel Folau had to adhere to.Reports are that he has simply ignored the clause and the additional protocols, and is thus in clear breach of his contract. Apparently the NRL has been very hesitant to say whether they would accept Israel Folau back into their competition. They fear a backlash from sponsors and broadcasters if they offer him a job. And so, one of the most stellar rugby careers of the recent past may be over.